In this lab you will configure OSPF over frame relay. 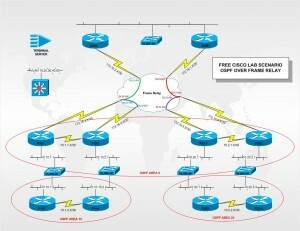 This is an intermediate level lab designed for CCNP students. The lab is not complete yet but the diagram should provide most of the information needed to practices OSPF over frame relay. I have included the GNS3 configuration file and the DLCI’s have been configured in the frame relay switch. If you do not currently have GNS3 it can be downloaded for free from the GNS3 download site. The GNS3 configuration for this lab can and will be used to simulate other lab such as IGRP, EIGRP, OSPF and BGP as well as redistribution of the protocols previously listed. This can be a really great study for me, Should confess that you are one of the best bloggers I ever saw.Thanks for posting this informative write-up.